US President Donald Trump has caused widespread anger by reportedly describing immigrants as coming from "shithole countries" during a White House meeting. He was apparently referring to Haiti, El Salvador and African countries. Mr Trump later tweeted that "this was not the language used". There are many examples of people from those countries making successful lives in the US and contributing to American society. Utah Republican Congresswoman Mia Love is of Haitian descent and called on Mr Trump to apologise for his comments. "This behaviour is unacceptable from the leader of our nation," she said in a statement. In her biography, Ms Love recalls her parents - who moved to the US from Haiti in the 1970s - working hard to earn a living. Image caption Mia Love said President Trump's words were "unkind, divisive and elitist"
She quotes her father saying: "Mia, your mother and I never took a handout. You will not be a burden to society. You will give back." Haitians account for less than 2% of the US foreign-born population, according to the Migration Policy Institute, but the numbers have increased in recent decades. Political and economic instability and natural disasters over several decades have left Haiti as the poorest nation in the Americas. Following the devastating 2010 earthquake that killed more than 200,000 people, the US offered Haitians Temporary Protected Status (TPS), but the Trump administration has said it will end the agreement. Carlos Castro, president and CEO of Todos Supermarket, is often held up as the archetypal self-made millionaire. He fled the civil war in El Salvador in 1979 and entered the US illegally, later being deported. But he returned and worked in a series of lowly jobs before becoming a legal resident in 1986. He then opened his first grocery store which grew into a successful chain now catering to Latino shoppers around Washington DC. The US National Grocers' Association describe him as "more than just an innovate entrepreneur, he's a mentor to many in the Hispanic community and fledging business owners". Latest figures show about 1.3m Salvadoreans living in the US, according to the Migration Policy Institute. El Salvador is plagued by gang violence and has one of the world's highest murder rates. Criminal gangs, known as maras, were formed initially in Los Angeles in the 1980s by children of migrants escaping El Salvador's civil war. When the war ended in 1992 many returned home, taking the LA gang culture with them. Bozoma Saint John, whose parents are from Ghana, is the chief brand officer at Uber and the former head of global consumer marketing at Apple Music. In a speech she made in 2016, Ms Saint John said she had been inspired by the personal journey that her father had made from being a musician in the Ghanaian army to graduating from a US college. US politician Ilhan Omar was born in Somalia and moved to the US with her family when she was eight. In 2016 she was elected to the Minnesota House of Representatives, becoming the first Somali-American Muslim legislator elected to office in the US. In her biography, she tells how her family fled Somalia's civil war and spent four years in a Kenyan refugee camp before emigrating to the US in the 1990s. "As a single parent my father chose Minnesota for the promise of welcoming neighbours, a great education and economic security. We found that here," she said. Image caption Elon Musk once said that "the more voices of reason that the president [Trump ] hears, the better"
Elon Musk, a South African-born inventor and entrepreneur, is the founder of SpaceX and the CEO of electric car-maker Tesla. He was born in Pretoria and moved to California in his 20s to study, becoming a US citizen in 2002. Mr Musk once described himself as "nauseatingly pro-American", adding: "I would have come here from any country. The US is where great things are possible." 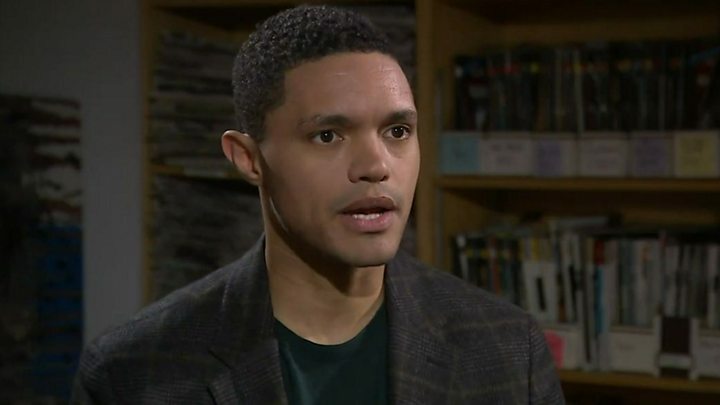 South African-born comedian Trevor Noah, who hosts the popular US satirical programme The Daily Show, has previously told the BBC that he believes Donald Trump "prefers white people over black people". "I do know that he doesn't want black people involved in the counting of his money or the running of his world," said. Following the president's latest comments he said that "as someone from South Shithole, I am offended". Media captionTrevor Noah: "I do know that he (Donald Trump) prefers white people over black people"
What has President Trump said about your country?